Our alpha picks did relatively well, outperforming in 3Q18. We remove Wheelock Properties as there was no revision to the offer price and ST Engineering has been added to reflect its recent accretive and strategic M&A. Encouraging performance in 3Q18 from our portfolio. Our portfolio performed relatively well in 3Q18, outperforming the FSSTI. During the period, the FSSTI actually declined 0.4% q-o-q. 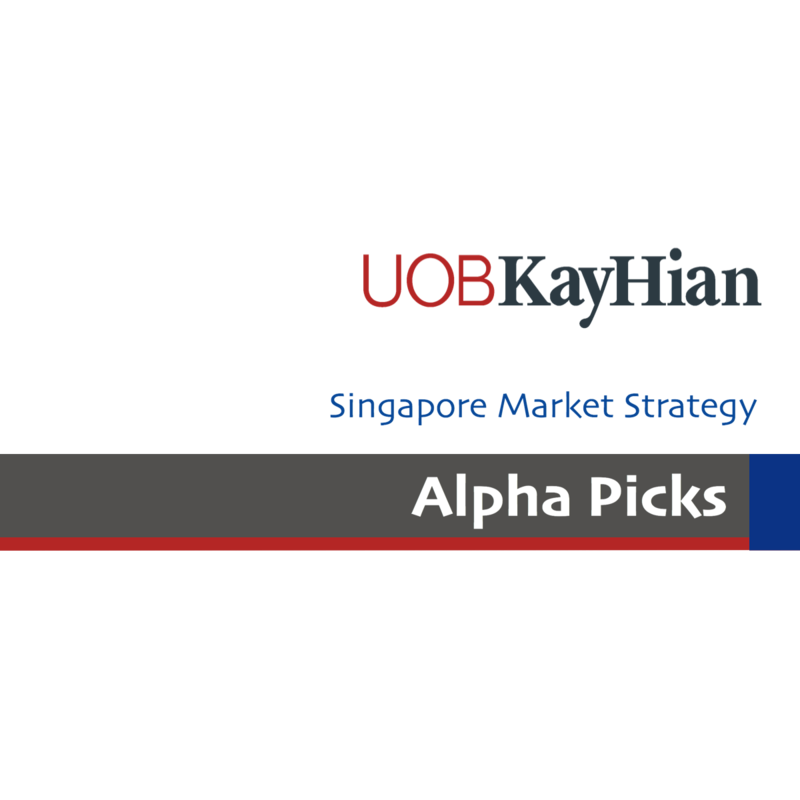 This compares to our alpha picks which delivered positive returns of 0.9% (market cap weighted) and 2.4% (equal weighted basis). Refreshing picks with the addition of ST Engineering and cutting loss on Wheelock. We remove Wheelock Properties from our alpha picks and suffered a 3% loss as there was no revision in the initial price. Otherwise, we add ST Engineering to our conviction list after its recent accretive M&A, which we deem to be strategic. Moving up the value chain with the acquisition of nacelle manufacturer MRAS. ST Engineering's (STE) S$606m planned acquisition of MRAS will be the company's biggest thus far and is expected to be immediately accretive, with EPS rising by 1.2 S cents in 2019 and another 1.72 S cents in 2020. By moving up the production value chain, the aerospace division will be moving up to an arena with less competition, unlike the maintenance business. Earnings will also be less orderbook dependent, given that Airbus' orderbook backlog for the Airbus A320 Neo is estimated at 9-10 years. Dividend payout will not be impacted. We expect STE's internal operating cash flow will be sufficient to fund dividend payout of 17 S cents in 2019. This is based on a payout of 85% in 2019. Based on that, STE would be offering an attractive yield of 4.7% at S$3.59 for 2019. Event: Guidance on MRAS revenue structure. Expect earnings to play catch-up in the upcoming quarters. Given that the recovery in the smart lighting segment is progressing smoothly and with continued robust growth from the ICE segment, we expect earnings to be better in the upcoming quarter. Demand for smart lighting is recovering. Valuetronics’ smart lighting customers indicated they expect better sales in 2H18. In addition, Valuetronics has been enjoying better demand in the recent months. Oher consumer lifestyle products in the consumer electronics division are expected to continue seeing stable growth, thanks to more product innovation. Healthy demand is expected to continue for the industrial and commercial electronics (ICE) segment as it continues enjoy better demand for connectivity modules used in the automotive industry. Event: Higher-than-expected dividends or M&As, backed by net cash of S$132m or around 40% of Valuetronics’ market cap. More customers in the automobile or internet of things segments. Higher NIMs from re-pricing of mortgages. Management expects a significant portion of its mortgages to be re-priced in 3Q18, especially those pegged to long-term deposit rates and prime rates. It ensures that upward movements in SIBOR and SOR are sustainable before it adjusts the interest rates for mortgages. Mortgages accounted for 26.1% of OCBC's total loans. Room to raise dividends. We see room for OCBC to gradually raise dividends. The group’s dividend payout ratios are 40-50%. Event: Rising interest rates could help underpin NIMs. Gradual rise in dividend payout. Hotel room supply is limited beyond 2017, with only 769, 1,664 and 392 rooms coming on-stream in 2018-20 respectively (2017: 2,868 new rooms). Event: Positive data points on visitor arrivals, average length of stay, average daily room rate, RevPAR and supply pipeline. Positive results from new operator and repositioning of its Maldives Hotel. The merger between TPG Telecom and Vodafone Hutchinson Australia is positive as it will consolidate the market in Australia from four to three players, which could lead to pricing stability. As at 1QFY19, Optus accounted for 21% of Singtel’s pre-tax profit. The group is least affected by a fourth mobile operator in Singapore as overseas businesses account for about 70% of its bottom-line. BUY with a target price of S$3.98. Solid proxy to recovering oil prices. CSE is a good proxy to recovering oil prices as two- thirds of its existing orderbook of S$175m come from the O&G sector. In addition, the stock offers a sustainable dividend yield of more than 6%. Potential synergies from new shareholder. Serba Dinamik, a Malaysian-listed company, recently bought a 25% stake in CSE at S$0.45/share. We see potential synergies as it could open up new markets for CSE, such as Malaysia and the Middle East. Event: New contract wins and continued recovery in earnings. Newsflow of positive new shareholder Serba Dinamik.